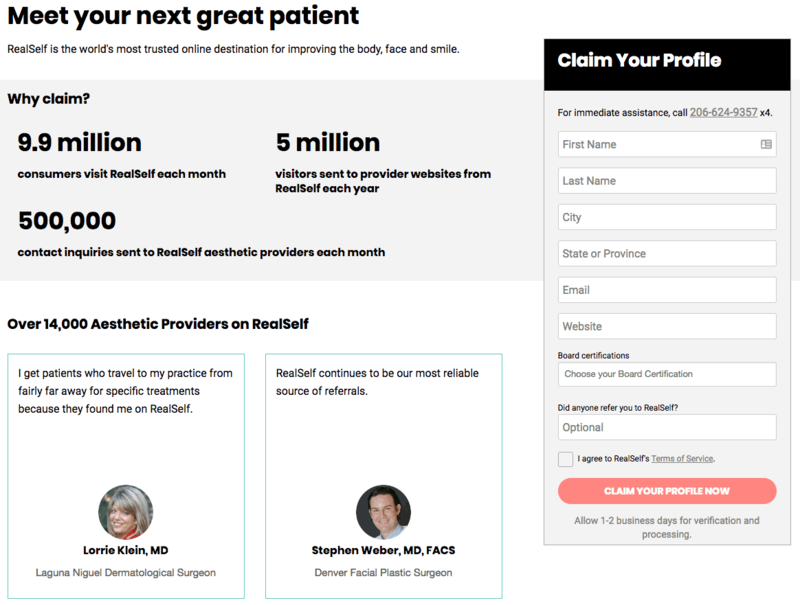 Organizations with doctors specializing in cosmetic treatments should get a listing on RealSelf. The cosmetic treatment-focused site features listings from over 20,000 physicians and attracts over 9.9 million consumers every month. Just like other industry-focused review sites like Healthgrades, RealSelf makes an effort to make all available information as easily accessible as possible. This starts with the home page, which encourages consumers to begin their search for a doctor or specific treatment. Customers can find a doctor based on country, state, province, or city, but RealSelf’s “Treatment Finder” is the star of the show. You start by choosing treatments based on a specific part of the body. RealSelf will then ask more specific questions about your treatment goals before presenting multiple options. Each treatment option also has its own specific page that includes helpful information such as its cost, patient reviews, videos, eligible providers, and a Q&A section. You can also find treatment options with a list of “Top Concerns” by patients or another list of the most worthwhile options based on factors like reviews or average cost. Listings are the backbone of RealSelf’s success, and any physician can get one on RealSelf for free provided that they meet the site’s “Healthcare Professional Listing Criteria.” This requires that each healthcare provider listed must meet one of the many medical verification requirements (such as a valid license or a verified certification from specific organizations). There’s also an option to tell RealSelf if someone referred you to the site. After agreeing to RealSelf’s Terms of Service, you can hit the “Claim Profile” button to finish the process. Verifying and processing the application will take one to two days. 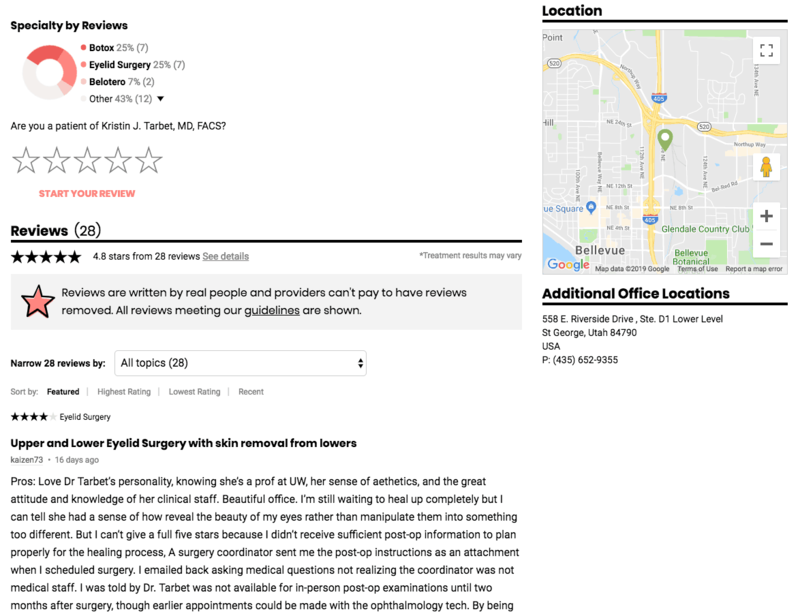 At a glance, consumers will see the overall star rating and the total number of reviews for the physician at the top of the listing page. Clicking on either score will bring up the page’s review section. Patients can review in one of two ways: through the “Start Your Review” tab on the site’s navigation bar or directly on a listing page. The “Start Your Review” process requires the reviewer to answer a few questions such as the type of treatment they’re reviewing and whether or not an appointment was already scheduled. They also have the option of directing their review towards a specific physician or to just rate the overall treatment experience. 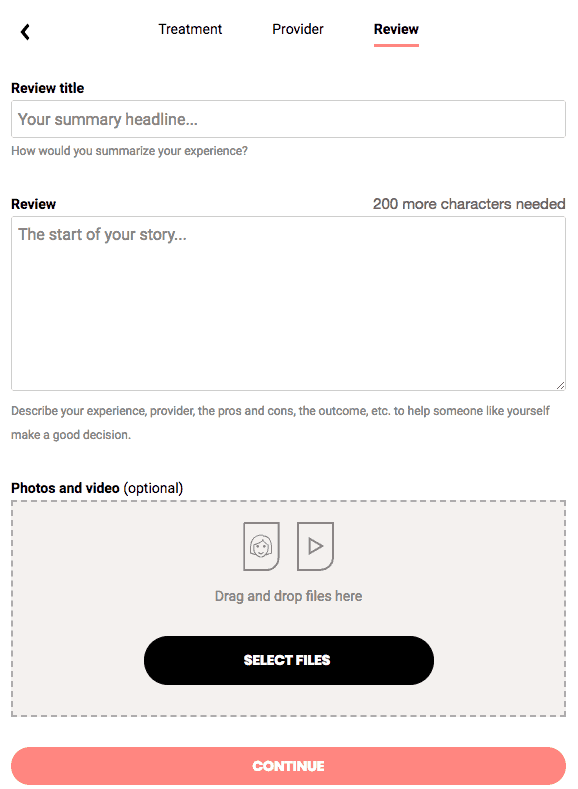 The final page of the process will ask patients to give their review a title and write a minimum of 200 characters for the review. Patients also have the option to upload a photo or video of their treatment as an additional supplement to the review. Creating a RealSelf listing is the first of many steps to improving any physician’s online reputation. There are plenty of things to do once a listing is up and running, and we have some tips on some best practices that should point you in the right direction. Each listing page has a plethora of digital real estate where you can add vital information that can better inform potential patients about a physician. Things like contact and location information are standard for any listing, but they can still have a significant impact on patient conversions. Taking advantage of the Q&A section is also important because it’s one of the first opportunities for physicians to answer any concerns that future patients might have before they set up an appointment. Anyone on the site can answer these questions, but it seems like an answer from a licensed physician ranks higher on the list of responses so make sure to take some time to get responses. Another crucial part of any doctor’s online reputation is the patient reviews they receive. Monitoring listings for new reviews on a regular basis ensures that you stay on top of rave feedback as well as reviews that point out flaws in the patient experience. You might as well also set aside time to respond to reviews. Responses show patients that you care about their feedback and using it to further improve the various aspects of the experience like wait times, appointment services, or even the doctor’s bedside manner. Before responding it’s important to have a plan in place so that each response sounds personal and professional at the same time. You should also make sure that each response is HIPAA-compliant to avoid any legal issues.